As temperatures rise this summer, people turn to local beaches and lakes as a fun way to cool off. However, recent toxic algal blooms have hindered this experience for some in places like Florida, California, New York, and Vermont. Algae are vitally important to marine and fresh-water ecosystems, and most species of algae are not harmful. However, according to the Centers for Disease Control and Prevention, a harmful algal bloom (HAB) can occur when certain types of microscopic algae grow quickly in water, forming visible patches that may harm the health of the environment, plants, or animals. HABs can deplete the oxygen and block the sunlight that other organisms need to live, and some HAB-causing algae release toxins that are dangerous to animals and humans. Less than one percent of algal blooms are toxic. However, not only is it unsafe to swim when toxic blooms are present, but toxic algal blooms are a growing environmental health concern. 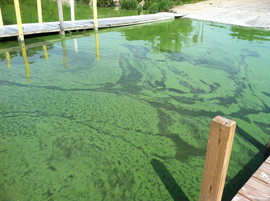 Nutrient runoff into lakes, streams and other bodies of water can cause algal blooms. NIFA is working to monitor and mitigate the effects of excess nutrients and prevent its occurrence in the first place. One example is NIFA’s support of the National Atmospheric Deposition Program, which tracks how airborne nitrogen is deposited in the U.S. and contributes to the dead zone in the Gulf of Mexico. The agency provides $500,000 in funding for state agricultural experiment station research and coordinates $1.8 million per year of interagency funding in support of the program. Using cover crops can mitigate nutrient discharge into watersheds and significantly reduce soil erosion across the state. A team of NIFA-funded researchers from Ohio State University implemented ECO Farming, a natural and sustainable production system, to reduce nutrient runoff. Using continuous living cover crops, farmers were able to prevent soil erosion, increase water filtration and decrease nutrient runoff. This method uses a crop production system that mimics natural cycles in soil feeds, the microbes which recycle nitrogen, phosphorus, and water back to plant roots; ultimately improving soil structure and increasing water infiltration and water storage. Another project at the Virginia State University (VSU) Agricultural Research Station is studying the use of chemical precipitation methods to simultaneously remove nitrogen and phosphorus from municipal and animal wastewaters. Researchers used a magnesium solution to remove nitrogen and phosphorus in the form of dittmarite, a naturally occurring mineral that contains magnesium, phosphorus and nitrogen. The process removed more than 95 percent of the phosphorus and 21 percent of the nitrogen from the three tested wastewater samples. A pilot-scale wastewater treatment plant is also being constructed at VSU. For more NIFA impacts, visit nifa.usda.gov/impacts or the Land-Grant University Impacts website. Send us your NIFA-funded impacts at impactstories@nifa.usda.gov or share them with USDA_NIFA on Twitter #NIFAimpacts.